See you later… – …STILL CRAZY AFTER ALL THESE YEARS! On Sunday, I had to send my girl back to her jungle school as usual so my Kuching cousins and company had to be left to their own devices. They had been going around here and there eating this and that and at first, they thought they did not want too many bowls of the rice but once they tried, they actually wanted more but they had to refrain from ordering a second helping as they had to save some tummy space for the rest of the day. Yes, it was that good! …and yes, they liked it a lot too. …which tasted great but we all agreed that what we had at the Italian fusion restaurant two nights earlier was a whole lot nicer. …and they loved it to bits. “Next time, we will just come here for this,” one declared, “No need to try anywhere else!” I would agree that it did taste really good though it looked kind of pale and I am more accustomed to the ones that are a shade darker. 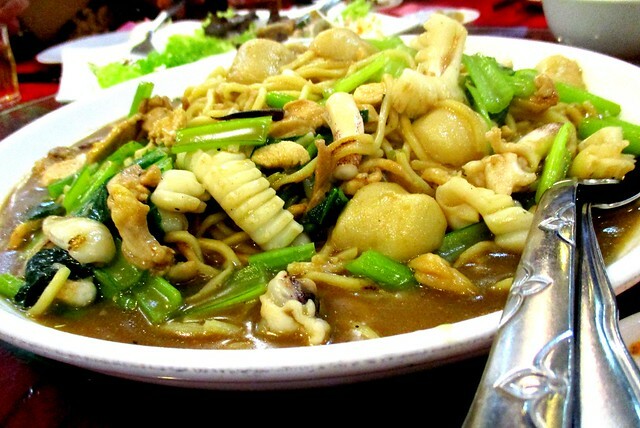 – one dish that they had acquired the taste for here in Sibu and they have loved it since…and yes, they do it pretty well here too. …to see if it was any better than what we had the night before but no, I thought it was more or less the same though it did look a whole lot nicer. There would be other better ones elsewhere, not here. Having said that, there can be no denying that it was good enough and I saw my niece, the one home from Perth, Australia, piling a whole lot onto her plate. I guess she was making the most of the opportunity as she would not be able to find it there and who knows when she will be coming back this way again for this. …from this restaurant for them to try but it did not seem to get them all excited. I thought the ones here were nicer than those that we had for lunch the day before but I don’t quite recall them being so small and looking like that. I could have sworn that they were somewhat different and a whole lot bigger! I think the bill came up to around RM250.00, a little bit more than what my girl forked out for our dinner that night at the Italian restaurant (around RM210.00) but there were only 7 of us while this time around, there were 9 – they had other guests joining us that night for the dinner. So much yummy food! But for 9 persons, all will be gone in a blink of an eye. I would like the midin, fried ikan bawal putih, checkerboard duck and mochi mango best! Does the checkerboard duck include the duck skin beneath the deep fried crust? Not sure about the skin, I did spot the meat though – sort of pulled, in strips. All was good at the dinner…and of course, the lunch too. 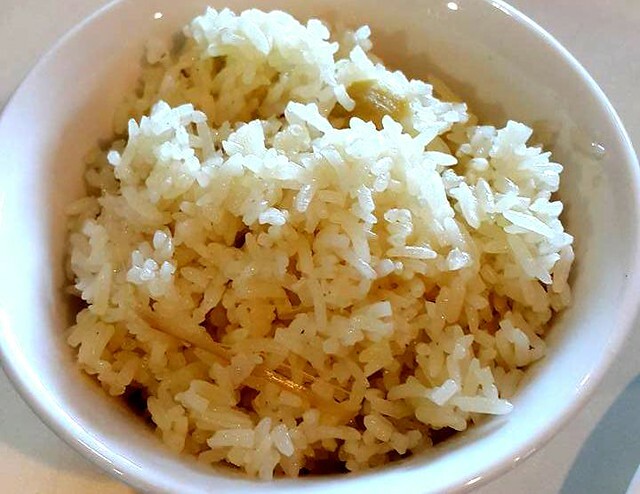 Rice is the staple here, for many, it is a must-have at every meal – chicken with rice, there are different versions between the various races here. 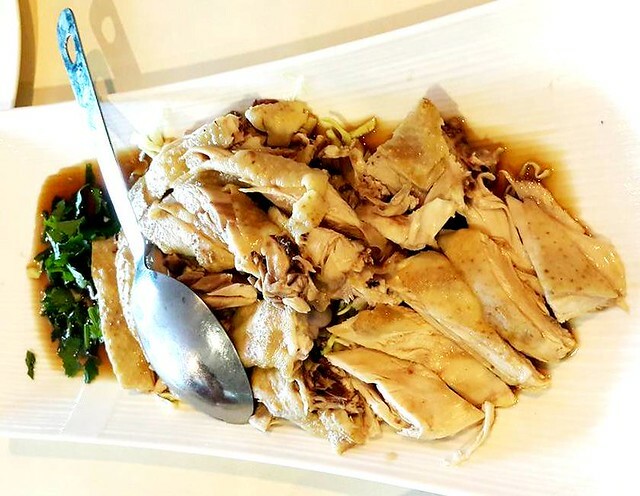 This one is Chinese, Hainanese to be exact. Everything looks delicious. Oh? What was in the rice. I love fragrant rice. Sometimes the flavors I use are delicate and other times, bod and spicy. 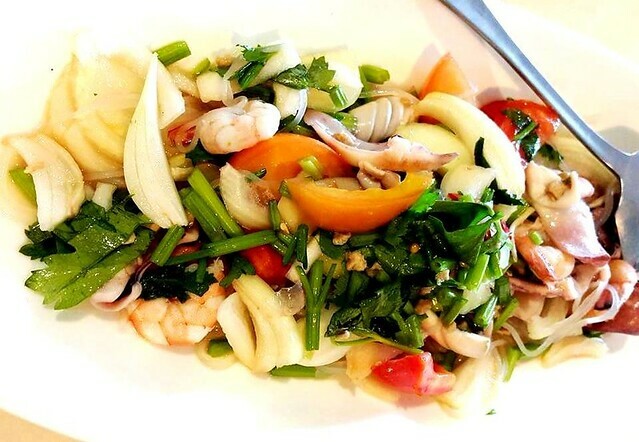 It all depends on what’s accompanying the dish. When you post them, I’m always drawn to the wild jungle fern. We don’t have that here in Maryland. I tried cooking chicken rice before but was not successful, not very nice. I fried ginger in the rendered chicken fat – I see lemon grass in Mary’s and I did spot some shallots too when I had it last time. Once fragrant, remove these from the oil, put in the rice and mix well. Transfer to the rice cooker – add the stock, dripped and collected from steaming the bird (and the ginger and lemon grass as well, not sure about the shallots)…salt and seasoning, screwpine leaves and cook. I am not sure if they use this same procedure or not. 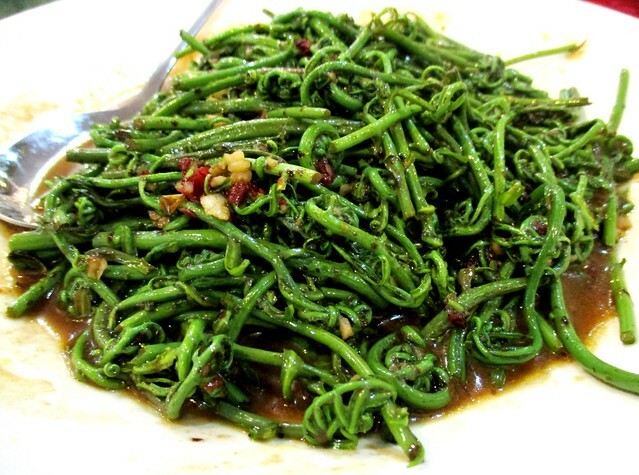 Even here in our country, we can only find the fern here in Sarawak (north of Borneo island) – not available in the mainland, same equatorial climate, maybe nobody going round to pluck or maybe all the jungle has given way to development, hard to find but they do have a different variety with leaves, red leaves. I hear they export it to Singapore! Everything looked delicious. I must try the checkerboard duck. Not sure we have this over here. The dessert is so lovely. 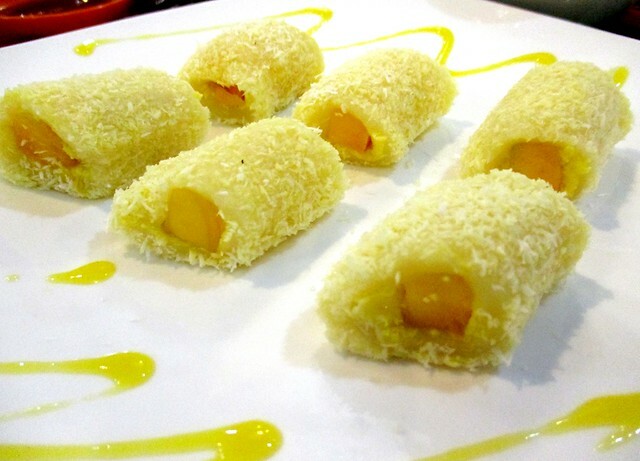 You’ll love it if you like mochi and the grated coconut coating. It was nice but I prefer what we had the last time – chee cheong fan skin with fresh mango inside and mango syrup poured over it. They say this checkerboard duck is very old school, nobody’s doing it in Kuching. Oh dear! Oh dear!!! I hope baby’s ok now, poor thing…and poor you! Take care, God bless, all. I know at least one…or two who would share your same taste. No fat, all lean the ribs but we were not all that fond of it deep-fried, would prefer it roasted or barbecued. Good choice of food & love them all to bits. 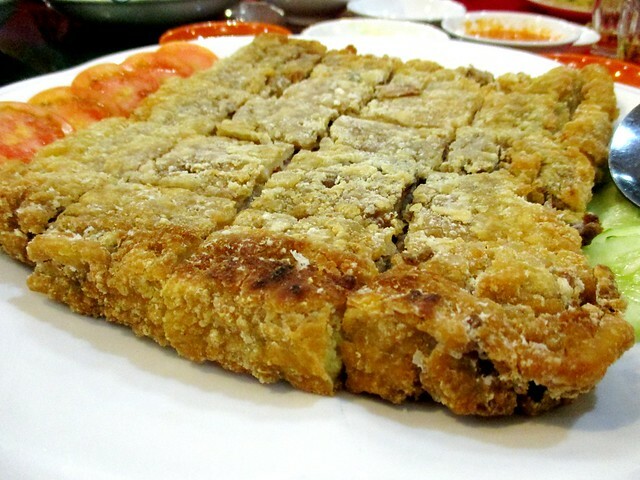 Fried pek chio??? 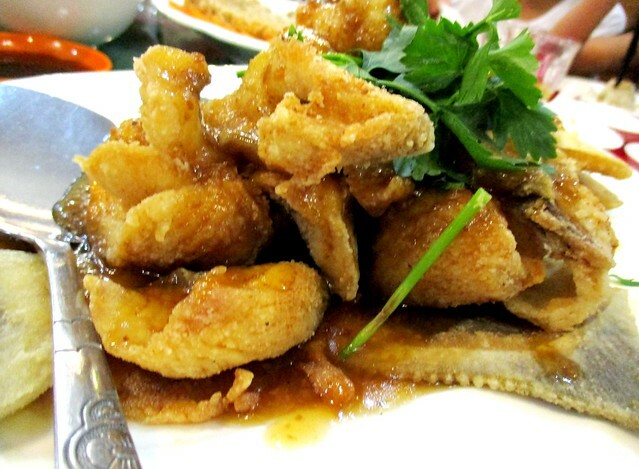 ?…As far as I know, people usually steamed it but never heard of fried, hahaha!! !…sua ku. 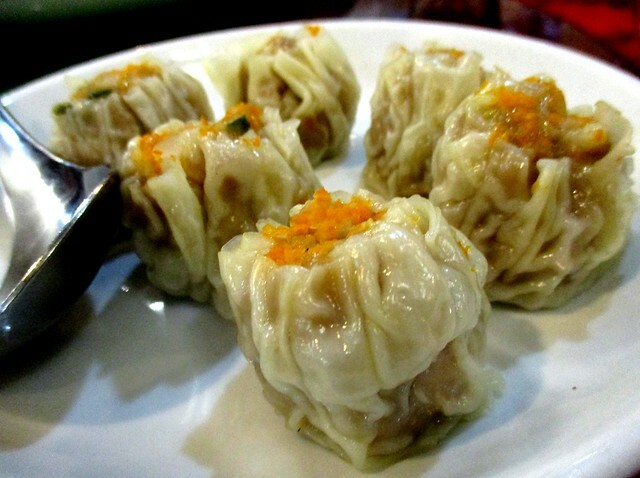 That is one reason why we ordered this – steamed is very common, can cook our own at home – this is very special, otherwise if fried, I would prefer or chio, the black ones. Nothing like good chicken-rice rice. Can’t stop myself from eating lots of good rice! Yes, most here are not fragrant, more often than not, they are hard and dry – not nice. This one is so good I would not mind having it again and again. 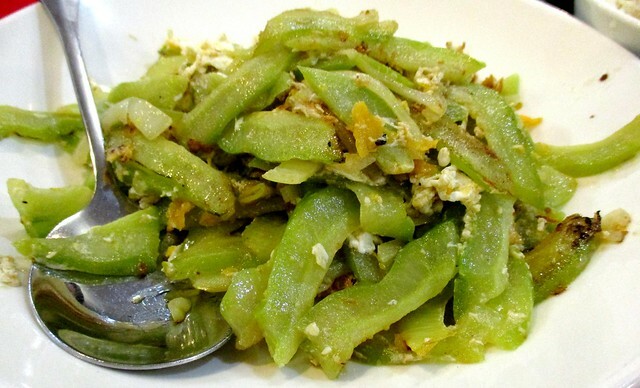 You will have to come Sibu then, have to convert you like everybody else – all would not touch bitter gourd till they tried the one here! My girl was another one, now she loves it! Bitter gourd? Invite Sharon over for dinner. Hehehehehehe!!!! Ooh, I’ve been away from Malaysia for nearly two months now and your friend’s chicken rice is really calling me to come back. You’re still abroad? Having the time of your life, I’m sure, so very nice there! You can ask her. Come, come on over! 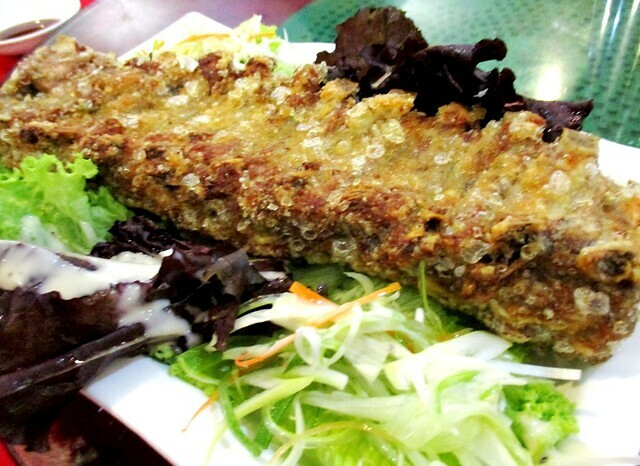 You’ve been all over the world but you’ve never been to Sibu, right? They say it is very old school, people had that a long time ago and it is not available anymore at most places – none in Kuching. Pingback: Leaving today… – …STILL CRAZY AFTER ALL THESE YEARS! Pingback: Quite sometime… – …STILL CRAZY AFTER ALL THESE YEARS!